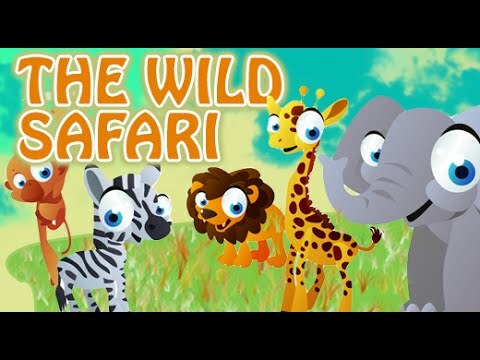 Watch the friends along with Maya and Vaayu going on a wild safari. Monkey is a wild animal, it feeds on banana's. Monkeys can imitate human actions. Bear is big and fat, bear's feed on honey. Bear's are good climber's on trees and have strong smelling power. Deer is the most beautiful wild animal, it has white spots on the body and feeds only on grass.Deer's are very good runners. Kangaroo's eat grass, they are good jumper's. The kangaroo's have a pouch on their stomach to carry their babies. Zebra's have white and black stripes, zebra's look similar to horses. Zebra's feed on grass. Giraffe is the tallest wild animal, giraffe has a long neck which helps them to eat tall trees. Hippopotamus are big and fat,hippo's have big mouth and teeth.Hippo's live both land and water. Elephant's are the largest wild animals,it has a long trunk and big teeth known as tusks. Lion is known as the king of the jungle, its color is golden brown. The lion has powerful paws and jaws. Tortoise is the slowest animal, it has a big shell on its body to cover and protect from other animals.